To make way for new and exciting clothing lines, we’re having a sale in the Saltire and Alba Clothing Departments! 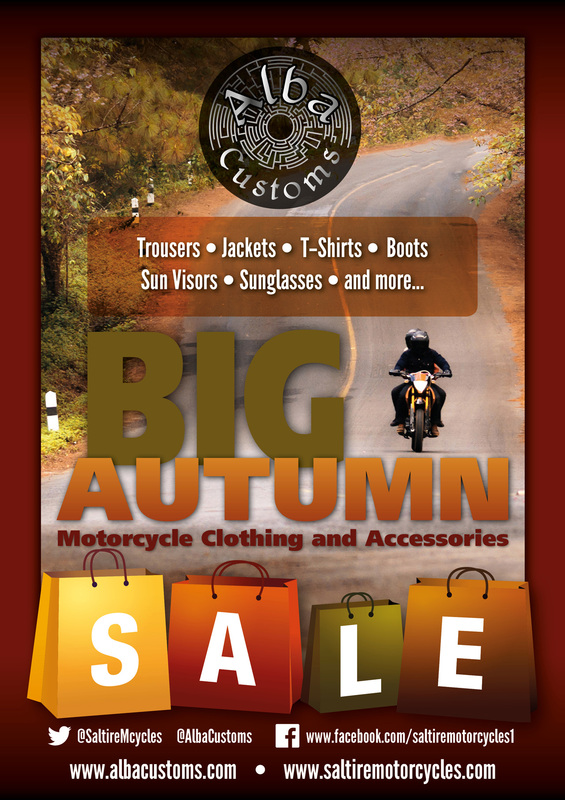 Come and check out our great offers including free cleaning kits with helmets, 15% off Wiley X sunglasses, Half price Knox armoured vests when you buy a Knox Jacket, free dark visors with selected Shoei helmets, half price base layers when you buy a textile suit, as well as price drops on leathers, gloves, jeans, casual wear and more. Beat the rush by shopping in October, or just make this an excuse to treat yourself! All Autumn Sale items must go while stocks last. Terms and Conditions: Autumn Clothing and Accessories Sale discounts cannot be combined with any other sales discounts or promotional offers, including Rider Training Student discounts. Offers valid on stock items only and may be withdrawn at any time without notice. Please note that our standard terms and conditions of sale also apply.